When I was five years old, I was so weak and scrawny that the doctors thought I might have leukemia. In desperation, my parents took me to a natural healer named Dr. Wickenham who lived in a run-down trailer park. “Dr. Wicked Hand,” as my friends called him, discovered that I had serious food allergies. I changed my diet and was soon running with the other kids and working hard on my father’s farm on the Ohio-Pennsylvania border. In high school I took an interest in boxing, until an injury nearly crippled my spine. I could barely walk for weeks and several doctor’s visits brought me no relief. Eventually, my mother took me to a chiropractor who treated my spine, muscles, and acupuncture points. Soon I was feeling better than ever. This experience heightened my interest in natural health. In my early 20s, my aging father put me in charge of the farm. My passion for all things natural was growing by leaps and bounds, so I converted our operations to an organic, biodynamic farm. Meanwhile, my enthusiasm for the healing arts grew. I read everything I could about natural foods and health. I went to hear a crazy eighty-year-old man named Dr. Paul Bragg speak, and he exploded my old-age stereotypes! A few years later, I was astounded to hear that he reportedly died from complications received from a surfing accident. In his 80s! These were my days of discovery, as I learned how detrimental many aspects of the Industrial Revolution and the so-called advances of modern science and technology have been to human health. I began to see a need for another kind of revolution. I still remember the day in 1975 when I decided to become a healer instead of a farmer. I soon obtained two degrees: Doctor of Chiropractic and Naturopathic Doctor. In 1979, I established a multi-practitioner natural health clinic. People drove from miles around to visit our clinic that was located in the spacious house my father had built on our farm. We gained a reputation for catching people who were at the end of their ropes, whose challenging symptoms left other doctors scratching their heads. “Specializing in Difficult Cases” became the tag line on our business cards. We were passionate about finding the root causes of illness, rather than simply treating symptoms. We also helped pet owners by giving chiropractic adjustments and natural remedies to dogs, cats, horses, buffalos and even chickens. Meanwhile, I developed new approaches to natural health care, including pure water-based homeopathic medicines. In 1989, I established King Bio, an FDA-registered company that researches, manufactures and sells natural homeopathic products. King Bio soon expanded into six brands: Dr. King’s Natural Medicine, Natural Pet Pharmaceuticals, Natural Veterinary Pharmaceuticals, SafeCareRx, Safecare and Aquaflora products. In addition to being a practitioner in the healing arts, I’m a fourth-generation family farmer. When we relocated to the Southern Appalachian Mountains, which contain the largest temperate rain forest in North America, we desired to take advantage of its natural biodiversity. 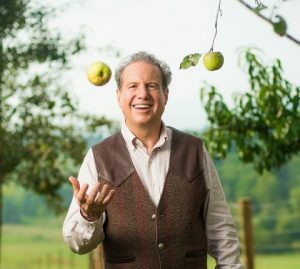 The hearty environment of Western North Carolina has enabled us to research and develop a wide variety of wild, nutrient-rich and medicinal fruits, vegetables and herbs. In 1985, I began raising bison as a healthier source of meat and eventually established Carolina Bison. On the ranch, our robust bison herd, which includes wisent, plains, and white bison, graze freely on hundreds of open pasture acreage, reminiscent of the original native herds. We also raise yak, Watusi, and camels and grow wild muscadine grapes and therapeutic herbs. Our mission is to discover and promote healthier lifestyles by offering healthy meats and other wild superfoods that awaken our positive genetic expressions. My wife, Suzie, and I live with our children on our farm in the Blue Ridge Mountains of Western North Carolina. We partner with a dynamic team of workers who take pride in producing the highest quality of natural health products for people, pets and professionals.